Press Release: foodpanda launches up to 80% Off on 200+ Restaurants...!!! Pursuing their tradition of closing the year with a tasty treat, Pakistan’s much loved online food ordering platform, foodpanda, is cooking something tasty again! 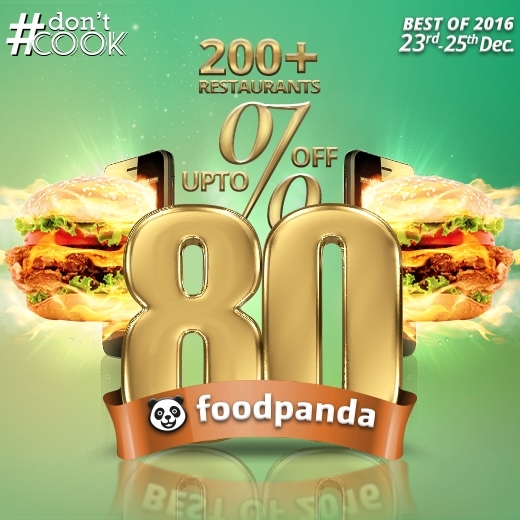 They have declared 23rd to 25th of December 2016 as three days of no cooking with a loud and clear message: ‘#DontCook (23rd – 25th Dec)’, through their campaign ‘Best of 2016’, where they will be offering up to 80% discount on more than 200 restaurants nationwide. And this powerful call for all the foodies out there seems really promising. According to team foodpanda, the meticulous idea behind this campaign is to close this amazing year with a bang! Since, the last week of December is itself a festive time of the year - all kids are enjoying their winter vacations; the entire nation observes a national holiday on account of Quaid-e-Azam’s birthday; and the Christian community in Pakistan is celebrating Christmas - henceforth foodpanda has planned to turn these festivities into a grand celebration with their mind-blogging scheme: The entire nation is to lock up their kitchens and order in from foodpanda for three consecutive days and spend a great time with their loved ones with delicious food, that costs next to nothing! This campaign is expected to hold out the greatest deals and discounts ever offered! Celebrities, top chefs, partnering restaurants and all the foodies – who by the way happen to be ardent users of foodpanda –are all highly excited since Pakistan’s favourite food chains like KFC, McDonald’s, Domino’s, OPTP, Broadway, New York Pizza, and many others will be offering huge flat discounts and massive value-for-money deals on foodpanda giving their customers an utter convenience of ordering with just a few taps on their phones. Thus, having savoured foodpanda’s exclusive deals on top restaurants during their events like Flat 20% Off and Free Delivery, foodpanda’s 4th Anniversary, The Great Online Food Festival, Black Friday and many more exciting campaigns throughout the year, we await with our mouth drooling and fingers crossed, for a tasteful close to such a happening 2016! foodpanda is a global mobile food delivery marketplace headquartered in Berlin, Germany, and operating in 24 countries and territories. The service allows users to select from local restaurants and place orders via its mobile application as well as the website. The company has partnered with over 40,000 restaurants. foodpanda is one of the fastest growing e-commerce businesses in Pakistan; recently the online giant achieved a truly extraordinary milestone in record time when it reached PKR 1 billion in revenue generation. Review: Stageline Ultra Defined Mascara...!!! Stageline Ultra Defined Mascara comes in silver packaging. The packaging is not something that will catch your eye. It is prone to scratches and the name and design on packaging also fades away easily. 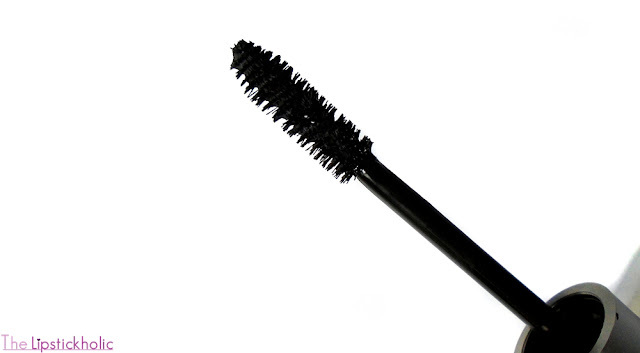 This mascara comes with a medium-sized straight wand. The size of the wand makes it easier to reach to the inner corner lashes. 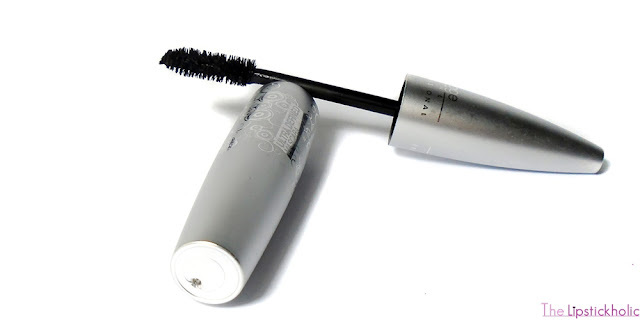 This mascara has thin consistency yet it dries quickly in reasonable amount of time. It is richly pigmented and is jet black. When it comes to mascaras, I prefer those that separate and define lashes and add volume to them. One coat of this mascara defines and lengthens the lashes. It doesn't clump which is a huge plus. However, it doesn't provide much volume even with 2 coats but I think that's fine as this is a lash defining mascara, not a volumizing one. It feels light weight and doesn't cause my lashes to feel stiff or heavy. Its staying power is pretty nice and it stays almost all day long. It doesn't flake or smudge either. It is not waterproof though which is a con. Overall, I think its a decent mascara for casual use. It does what it claims. 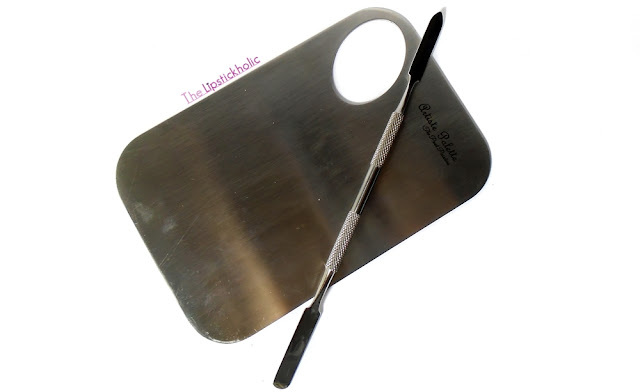 It defines and lengthens the lashes. It doesn't flake or clump and doesn't feel heavy. I like using it for casual use and like how it defines my lashes and make them look naturally long. However if you are looking for a mascara that adds volume and is waterproof, then this one is not for you. Price & Avaiability: Stageline Ultra Defined Mascara is available at leading stores nationwide for Rs 1095. Also available online at Daraz.pk. Check out the complete range of Stageline mascaras and other products at Daraz. For more information on the brand and its latest launches in Pakistan, Join Stage Line Professional Pakistan on Facebook. Press Release: Sapphire launches four collections nationwide in their anniversary month...!!! Following the launch of Sapphire Winter Volume 2, Sapphire’s Silk Anniversary collection “Route de la Soie” has launched nationwide on the 6th of December, 2016. The anniversary collection will be followed by the launch of their Wild at Heart and Menswear collection on the 16th and 19th of December, 2016. Sapphire’s anniversary collection Route de la Soie is about celebration of great aesthetics and quality. The collection comprises of silk dupatta and shirts featuring fashion forward prints with a modern flair. This two-piece silk collection celebrates the ubiquitous label’s second year in fashion with an exclusive range of luxurious silk fabrics and striking hues with a mix of contemporary silhouettes. The price range for silk tunics is PKRs 6,990/- and Silk Dupatta is for PKRs 2190/-, the two piece collection can be sold separately as well. The photography of the campaign is done by Nadir Feroze Khan, hair and makeup is by Raana Khan and face of the campaign is Amna Ilyas. Following the Sapphire’s festive Anniversary collection, their “Wild at Heart” collection will be launched in stores nationwide on the 16th of December, 2016. This stitched winter khaddar collection has a vibe of the magnificent and fanciful world of spell bounding colors, dramatic prints and captivating silhouettes. ‘Wild at Heart’ is all about embracing one’s eccentric side and gearing up for a playful mix of contemporary designs and striking hues! Sapphire’s coveted menswear collection will be launched on 19th of December, 2016 nationwide featuring Sapphire Man, Adnan Malik. The collection features the celebration the rich heritage and diverse culture of subcontinent and is inspired from the opulent lifestyle of Maharaja’s, the oriental exoticism of the land and the subtle British influence. The collection seamlessly blends plush fabrics with contemporary silhouettes to create timeless pieces. Review: E.L.F. Daily Face Cleanser...!!! Hope your week is off to a great start. Winters are here and our skin needs extra care in dull and dry weather. I recently included e.l.f. Daily Face Cleanser in my skin care regimen. E.l.f. claims this face cleanser to remove everyday impurities, dirt, and makeup. Also it is claimed to be infused with purified water to help hydrate the skin. I have been using this face cleanser for about a month now. So let's get to the review to find out what do I have to say about this Daily Face Cleanser by e.l.f. E.l.f. Daily Face Cleanser comes in a light minty green colored squeezable tube. 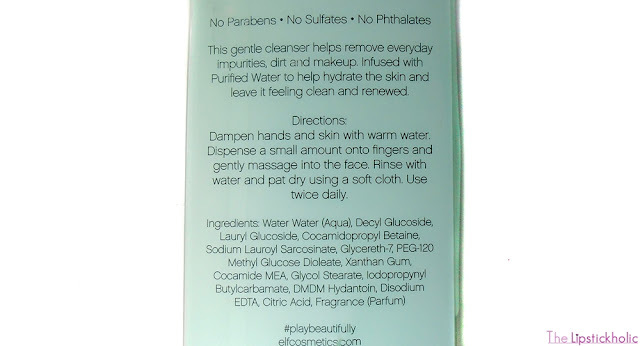 The ingredients and instructions to use the cleanser are written on back of packaging. The tube is similar to our regular face wash tubes. However in my opinion, tube packaging is not really ideal for this face cleanser as its consistency is thin and you may tend to squeeze extra amount of cleanser. Also the cleanser tends to leak at times from the cap which is a con. The color of e.l.f. Daily Face Cleanser is pearly white. The texture of this face cleanser is similar to liquid soaps. Its consistency is thin and runny. It also has a fresh and not so overpowering scent. This face cleanser does not produce a lot of leather like other face washes or cleansers but it does foam decently. You need to take small amount of this cleanser and gently rub it on wet face with fingers. Then rinse the face well with water and pat dry it. I have dry to combination skin and I usually get dry patches on my face in winters. This face wash removes oil, dirt and makeup from skin efficiently. It deeply cleanses the skin without drying it which is a huge plus. My skin felt much cleaner and smoother after using it for the first time. It didn't feel dry, neither felt oily. It felt just balanced. Like most of hydrating face washes, this one doesn't make the skin oily or greasy. It just makes it clean and smooth without any dryness. After using this face cleanser for few weeks, I can clearly say my dryness issues have been resolved. My skin feels just perfectly smooth and balanced. It even seems more even toned and healthy. Overall, this face cleanser has surely won me over. It cleanses the skin well and leaves the skin feeling clean and fresh. It is gentle on the skin. I no longer have any dry patches on my face after continuously using this for few weeks. My skin looks much smooth, fresh and healthy now. This face cleanser is suitable for all skin types and is particularly great for those with dry skin. Its price is a bit high for a drugstore face cleanser but it is worth the price. I surely recommend you all to try it out. Price & Availability: E.L.F. 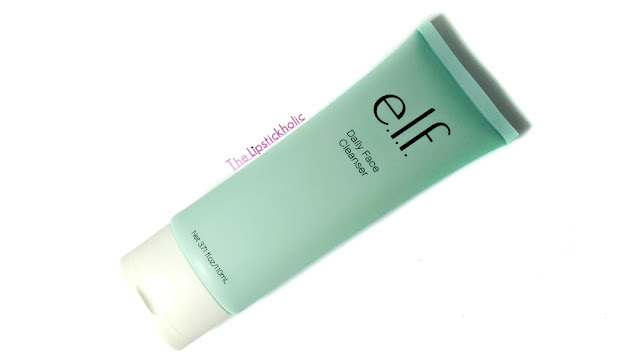 Daily Face Cleanser is available online at ELF Cosmetics Pakistan Website for ₨ 1,350. 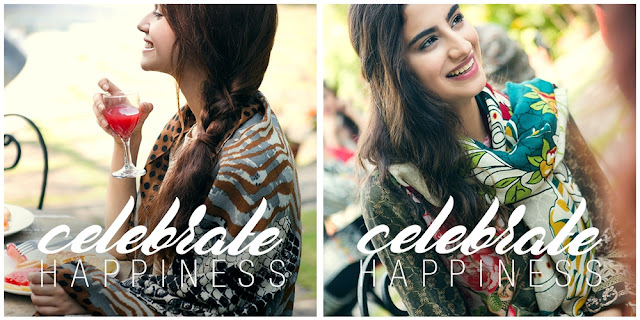 Check out the complete range of E.L.F products in Pakistan on the website. For international readers, this face cleanser is available at E.L.F. Cosmetics International for $7. For more information on E.L.F. 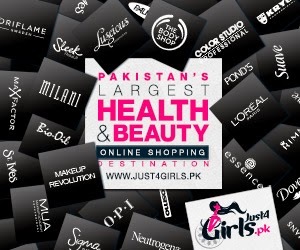 Cosmetics and its latest launches in Pakistan, join ELF Cosmetics Pakistan on Facebook and Instagram. Press Release: Nishat Winter Collection 2016 Volume II Launch...!!! Nishat Linen is launching its Winter Collection Volume II which will be available online and in-stores from the 1st of December, 2016. Volume II carries forward the idea of Volume I; depicting the strength and aspirations which resonate with the woman of today. 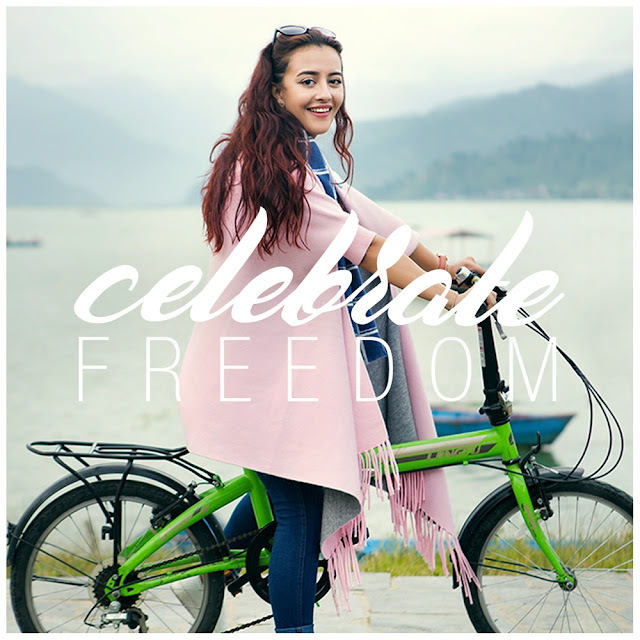 The campaign is set and shot in the beautiful locations of Nepal and promotes a sense of adventure and independence in women. 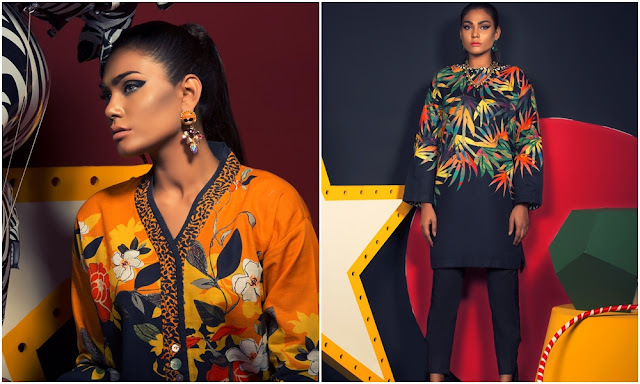 The models, Saheefa, Rehmat, Anushay, Maria Unera and Zenith, are female forces to be reckoned with, who want to teach women that it is possible to live life to its full extent without crossing any societal boundaries. Volume II includes more fresh floral prints, lush textures and dreamy hues which offer the right mix of effortless style and sophistication. The prints are glamorously feminine and an ode to all things beautiful and classy, just like the woman of today. The prices for the collection range between PKR 1750 to PKR 6200. 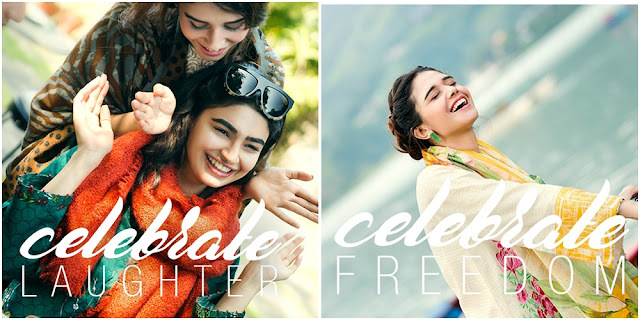 Nishat Linen is one of the biggest textile and home fashion retail chains in Pakistan that has redefined the industry with acute attention to quality, design and affordability. With an online store supplementing 72 outlets in 26 cities and expanding across the country, NL truly lives its motto: the fabric of Pakistan. NL boasts of international retail presence in Dubai, Abu Dhabi, Saudi Arabia and Canada as well. Review: Stageline H-Fix Gel Eye Liner in Black...!!! 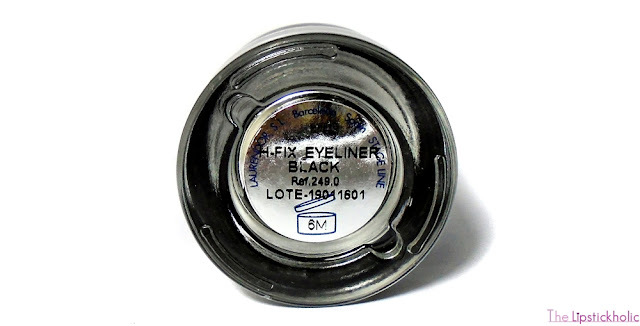 Stageline H-Fix Eye Liner comes in a glass pot. The texture of this gel eyeliner is very creamy. It is intensely pigmented and rich black. It applies easily and smoothly. However it takes some time to dry and set and does not dry very quickly. The finish of this eyeliner is not completely matte but kind of semi-matte to creamy. It is waterproof and smudge-proof. Once it dries and sets, it does not smudge. Staying power of this eyeliner is really good too and it stays on the lids almost all day long. My eyes are sensitive and I don't use gel eyeliners a lot as they tend to make my eyes watery. I am glad this eyeliner did not irritate my eyes, neither made them watery. I have had this eyeliner for over a month now and the weather is getting dry and cold here. This eyeliner hasn't dried out like other gel eyeliners so far which is a huge plus. All in all this Stageline H-Fix Eye Liner has impressed me. 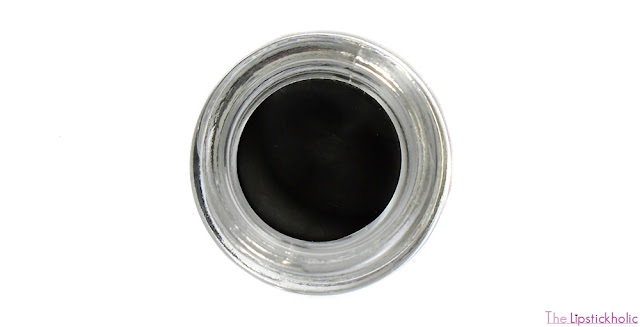 It is an intensely pigmented, rich black gel liner. Its creamy texture makes it easier to apply. The staying power of this liner is pretty nice too. For the price, this liner is really good and worth buying. Price & Availability: Stageline H-Fix Gel Eye Liner is available at leading stores nationwide for Rs 995/- only. Also available online at Daraz.pk. Press Release: ONE - Set to launch their flagship store on the 1st of December 2016...!!! Fashion forward and contemporary high street brand, ONE is set to launch their debut flagship store in Lahore on the 1st of December, 2016 at 10th Avenue, MM Alam Road, Lahore. The brand offers trendy and chic western wear for men and women and also caters to the retail needs of young and mature women alike with different silhouette options. ONE features an extensive range of product line consisting of tops, blazers, dresses, jeans, dress pants, vests, coats, cardigans, jackets and jewellery/accessories in their winter line all in affordable prices starting from PKR 790 to 4490. The premium fashion brand is a contemporary high quality casual wear brand which is affordable, trendy, visually appealing and captures personal expression of its customers. It is a lifestyle brand providing affordable prices, good quality and rich customer experience. The interior of the outlet has been designed by leading architect Yousaf Shahbaz of Strata. 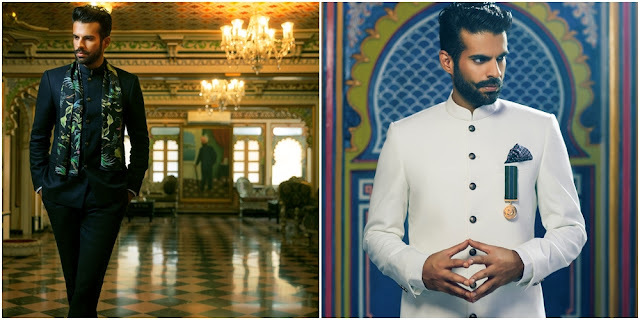 The shoot campaign has been shot by Nadir Feroz Khan and features highly acclaimed model Zara Peerzada along with the silver screen sensation Feroze Khan. Furthermore, the shoot has been styled by Haiya Bokhari, hair and makeup by Hannan Siddique and production is set up by Guddu Shani. For further information about the brand, follow #BeOneShopOne online at www.facebook.com/beoneshopone & on Instagram: @beoneshopone. 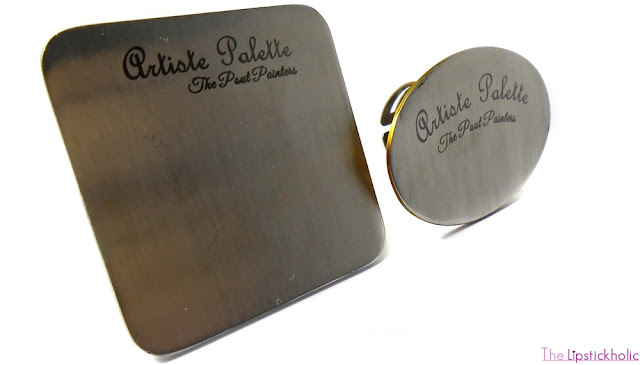 Review: Artiste Palettes by The Pout Painters...!!! 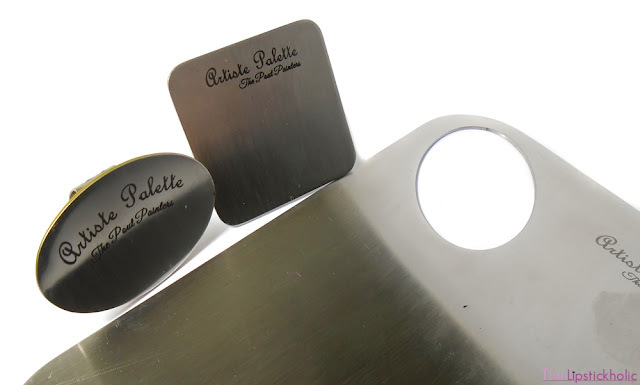 The material of all palettes is non-magnetic, rust-proof stainless steel. I like how each palette comes with a complimentary black pouch to keep it safe and clean. The palettes are lightweight. When I first saw these in pictures, I expected these to be bigger and heavier. However when I got them, I was surprised to see how lightweight these were. The size of all palettes is perfect to use and hold in hand. 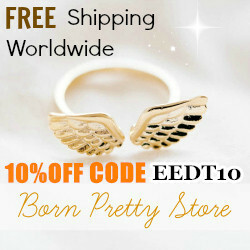 The rings are adjustable and size of ring palettes is neither too big nor too small. They are just perfect for quickly mixing some foundation or concealer without making your hands messy. You can mix almost any makeup product such as foundations, concealers, lipsticks, liquid brow tints, liquid highlighters and nail colors on these palettes. The palettes are not only limited to mixing makeup products but they are so versatile and can be used to mix many things. You can mix hair dyes, acrylic paints and many other things on these palettes. These palettes can be washed easily with just water, any liquid soap or your regular face wash. You can also clean them with makeup remover or makeup removing wipes. All in all, I would say these multipurpose palettes are very useful and make makeup mixing a lot easier and fun. The artiste rings are really good for makeup junkies like us who need to mix basic makeup products like foundation and concealers only in small amount. The large artiste palette is good for makeup artists and enthusiasts who want to mix and match different products and create different shades. The Pout Painters Artiste Palettes are a great investment and I surely recommend all makeup lovers to get few of these. Price & Availability: These Artiste Palettes by The Pout Painters are available at The Pout Painters Facebook page in the Shop section. 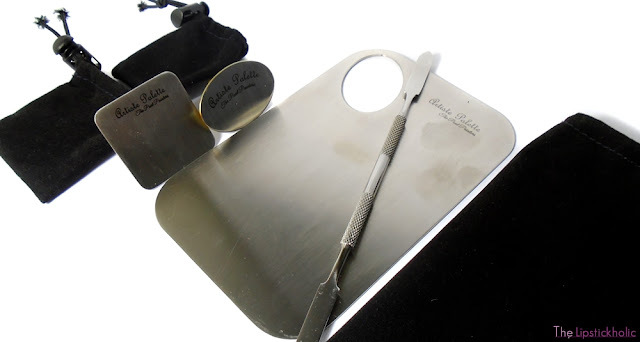 The Large Artiste Palette with Spatula costs Rs 1200. The Artiste Rings cost Rs 600 each (without spatula). All the palettes can be bought with or without spatula. Mention code "TL10%" to The Pout Painters when placing order for the palettes to get 10% off your purchase. 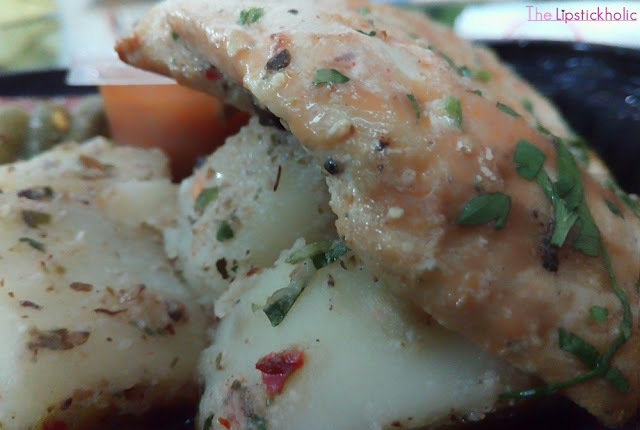 Food Review: Protein Factor Chicken Steak with Herbs...!!! Hope you are doing great. Today's post is for all foodies in Islamabad who want to eat healthy, lightweight, hygienic and yummy food in the city. 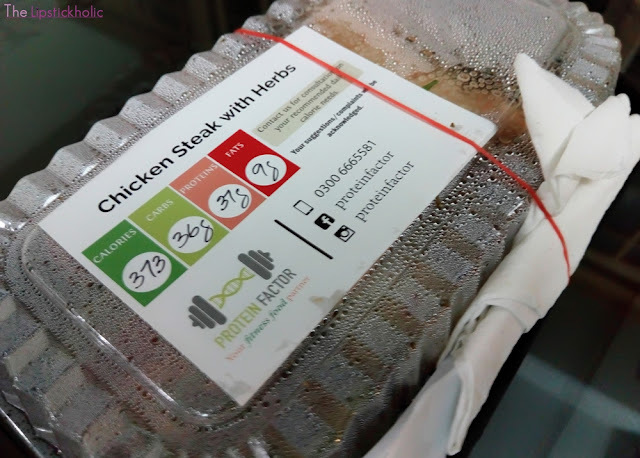 I recently tried out Chicken Steak with Herbs from Protein Factor, Islamabad. 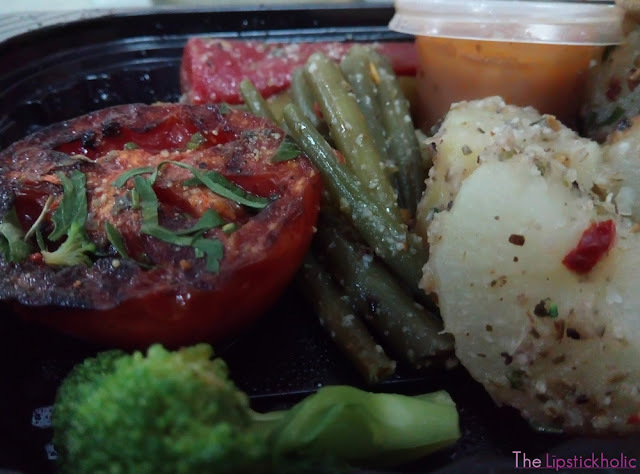 Protein Factor is a new place in twin cities that provides variety of healthy and delicious meals for fitness-conscious foodies. Let's get to the post to see what do I have to say more about this Chicken Steak with Herbs from Protein Factor, Islamabad. Protein factor offers various full meals including Chicken Steak with Herbs, Mushroom Beef Steak, Fish Fillets with Herbs and more yummy dishes. They also offer snacks and salads as side meals. I ordered their Chicken Steak with Herbs from the menu to try it out. My order arrived on time and it was hot and fresh. The steak was carefully packed in a nice disposable plastic container. The number of calories in the meal were written outside the packaging. 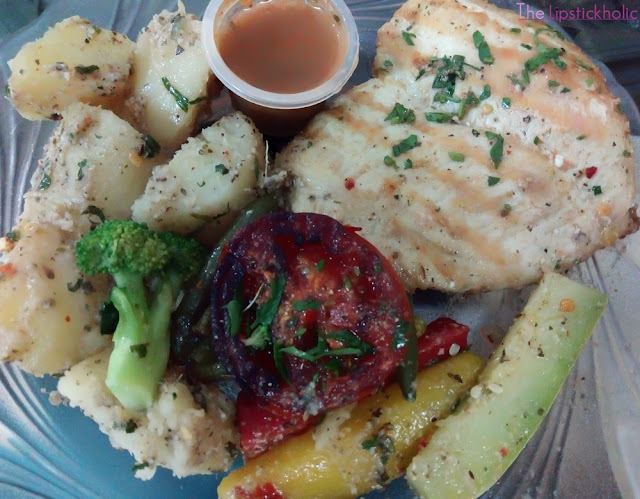 Chicken Steak was cooked perfectly and was served with sauteed veggies. I really liked the steak. Most of healthy meals are not-so-yumm. This steak however was really tasty and fulfilling. It had perfect combination of spices and a unique taste. The meal was lightweight. Perfect for those who want to control their diet and want to eat something healthy yet yummy. Overall, I really enjoyed this Chicken Steak with Herbs from Protein Factor. The steak was scrumptious and healthy. 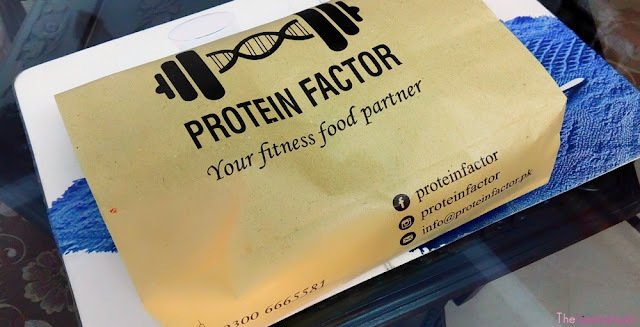 Protein Factor meals are nutritious and perfect for fitness/health conscious foodies. If you are residing in Islamabad, I surely recommend you to try it. Price & Availability: You can get Protein Factor food delivered at your doorstep by calling at 0300-6665581. Price of their meals is from Rs 250 to 450 each. You can check out their menu here. Join Protein Factor on Facebook for further details. Disclaimer: This post contains dish(es) that were sent to me for review purpose. However, this has not affected my opinion. My review is honest and is based on my own experience with the product(s) or company's service(s). For further information read my complete Disclaimer & PR Policy. 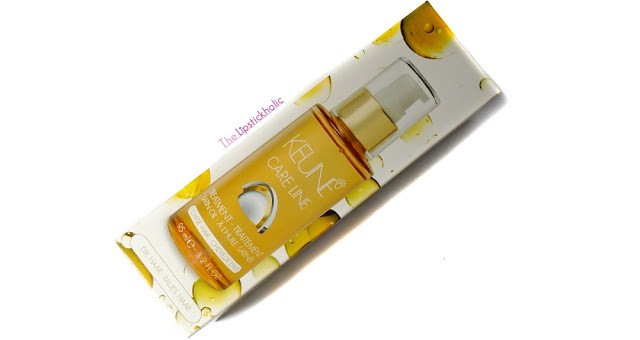 Review: Keune Care Line Satin Oil...!!! 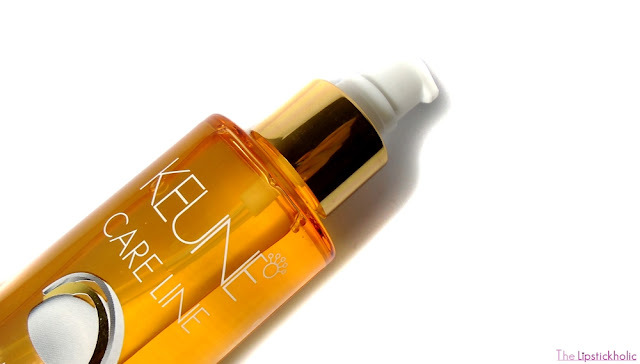 Keune Care Line Satin Oil comes in a 95ml transparent glass bottle. The one that I am reviewing is for "Coarse Hair". There is another one available for "Fine to Normal Hair". The bottle comes with pump which helps in dispensing just the right amount of oil. The instructions to use this oil are written on the packaging. This oil has many uses. It improves the texture and condition of hair, works as heat protectant, helps tame frizz and adds shine to the hair. It is best to apply this oil in damp hair after washing the hair. It can also be applied on dry hair before using any heating tool or for styling the hair. You can also mix it in Keune Satin Line Conditioner to get even shinier hair. My hair are very fine and slightly frizzy. 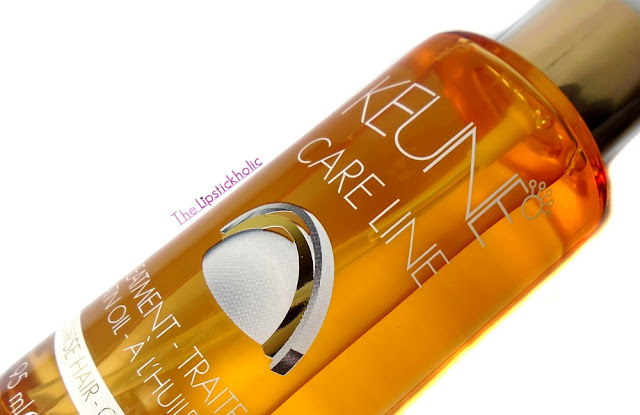 For those with extremely dry and rough hair, I recommend using Keune Care Line Satin Oil with the Care Line Shampoo and Conditioner (read review here). I have been using this Keune Satin Oil for past few weeks and I can surely say there is improvement in condition of my hair. This oil leaves my hair very soft, manageable and shiny. It doesn't feel heavy, greasy and doesn't weight down the hair. I am not sure if it has made my hair any healthier though but it surely makes them soft, shiny and smooth. 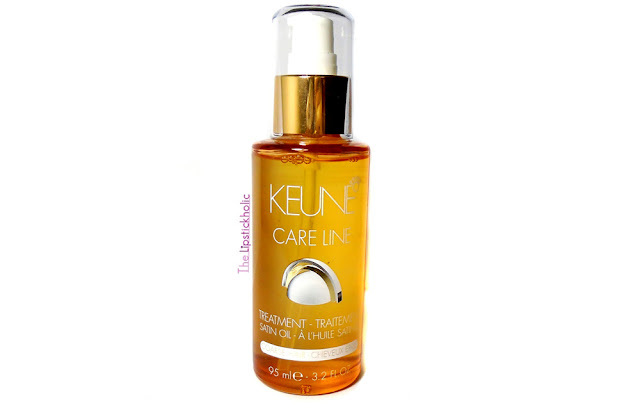 I definitely recommend you all to add Keune Care Line Satin Oil to your hair care regimen. Price & Availability: Keune Care Line Satin Oil is available at Keune retailers nationwide for Rs 1525/- for 95ml bottle. Press Release: L’Oreal Paris Hair Care Experts Revealed...!!! The world’s leading beauty brand, L'Oréal Paris, proudly launched the #ChooseYourHairExpert campaign for their L’Oréal Paris Advanced Hair Care with a reveal video featuring hair experts: Nadia Hussain for Total Repair, Natasha Saigol for Fall Resist, and Saima Bargfrede for 6 Oil Nourish. Indeed with the launch of this campaign, L’Oréal Paris endeavors to launch a 360 degree campaign that will educate the masses about hair care for different kinds of hair. In order to cater to hair care problems that women face every day L’Oréal Paris has specifically designed this campaign and assigned three renowned experts of the industry to help educate women about taking care of their hair at home. Nadia Hussain will be leading the campaign for damage repair being a pioneer model in the fashion industry where her hair is constantly treated, styled and colored for multiple projects. Natasha being a stylist will be focusing on helping women deal with hair fall which is a problem for most Pakistani women and Saima will be educating customers about the importance of nourishment for hair as Pakistani women often prefer to use oil to keep their hair healthy. The dynamic expert trio appears together in the reveal video of the #ChooseYourHairExpert. Photographer Fayyaz Ahmed and Videographer Hamad Khan also lent their expertise to the photo-shoot and video-shoot. The fashion forward wardrobe was in collaboration with Mango. Review: Pal Embroidered Linen Shawl Collection by Din Industries...!!! This particular design that I got is labelled as Pl-02 in PAL Linen Shawl Collection. This unstitched suit includes 3M Embroidered Linen Shirt, 2.5M Linen Trouser and 2.5M Printed Shawl. The shirt has embroidered neckline and beautiful printed border and back. The trouser of this suit is plain. The most beautiful piece of the suit is its printed woolen shawl. It is big enough to be wrapped around. It is lightweight yet warm enough for the season. Overall, I really like this PAL Linen Shawl Suit. The quality of fabric is good and embroidery is very neat. I like the bright and vivid colors and beautiful design of this suit. It is a nice and unique addition to my winter wardrobe. Price & Availability: PAL Linen Shawl Collection is available at leading stores nationwide. Also available at Din LifeStyle Website for Rs 2,490/- each. Press Release: Maybelline New York signs Ayesha Omar as the brand’s spokesperson in Pakistan...! Maybelline New York announces one of Pakistan's most popular, watched and recognized actors, Ayesha Omar, as their celebrity spokesperson in Pakistan. “We are excited to welcome the multi-talented Ayesha Omar as our spokesperson in Pakistan. 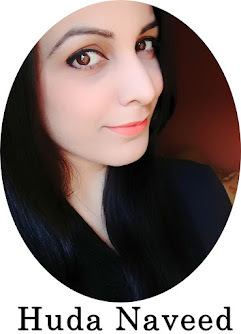 She embodies the brand values and represents Maybelline New York women all over the world who are smart, ambitious, and full of life,” said Farooq Ahmed, General Manager, Consumer Products Division, at L’Oreal Pakistan. “I am absolutely delighted to be the spokesperson for such an iconic international brand. Maybelline New York has always stood out to me for its bold, fun and sassy identity. 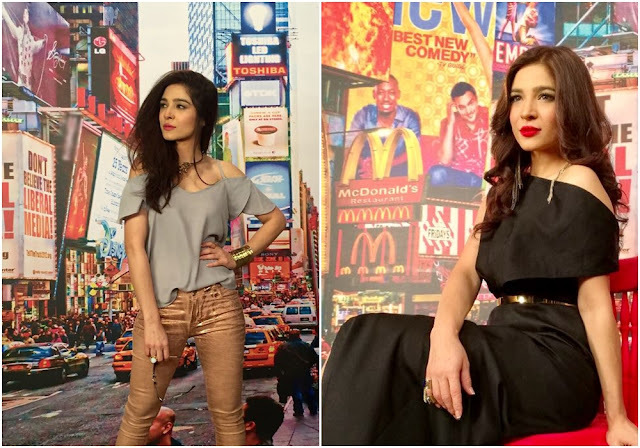 To be part of a brand which counts the likes of Christy Turlington, Gigi Hadid, Adriana Lima and Jourdan Dunn as its spokespeople is such an honour" said Ayesha Omar, Maybelline’s new spokesperson in Pakistan. Indeed Ayesha Omar is sought after for her immensely popular work across television, film and celebrity modeling. Ayesha is also an accomplished singer with album releases and an appearance at South Asia's most coveted music platform, Coke Studio, to her credit. Ayesha Omar will feature in Maybelline New York's major brand campaigns in 2016/2017 in Pakistan. From a small, family-owned business, Maybelline New York has now become the number one cosmetics company in word and is available in over 129 countries worldwide. As the fastest growing & ever strengthening pillar of growth in the L’Oréal Pakistan group, Maybelline New York combines technologically advanced formulations with on-trend expertise to create accessible cosmetics with a spirited style. Further capturing the essence of New York City style, Maybelline New York's fan page is the go-to destination for all the 'It' girls, offering exclusive, unique and behind-the-scenes beauty and fashion updates.